My father. Vaughan (Sr.) was on the West Virginia in Pearl Harbor on that fateful day December 7, 1941. He was forced to swim across the burning channel to escape. He breathed in those hot gases and eventually succumbed to emphysema in 1966. 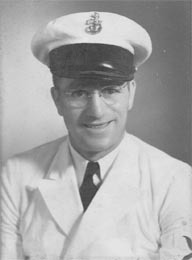 Because of his injuries, the Navy relocated him to recruiting in New Orleans until the end of the war in 1945. At the end of the war the Navy gave him a medical retirement and increased his rank to LT., JG. We then moved to the Los Angeles area where he became a refrigeration engineer. Later. when he was unable to that type of work, he went to work for the State of California Department of Employment. The last 2 years of his life he was in a lot of pain and had a lot of trouble breathing because of the emphysema. He died in San Bernardino, California in 1966 after spending a lot of time in military hospitals.